Allopurinol is a hypoxanthine analogue. Allopurinol inhibits xanthine oxidase enzyme and thus inhibits uric acid synthesis. Allopurinol is short acting but its major metabolite alloxanthine is a long acting non-competitive inhibitor of uric acid synthesis. Zyloprim administration can decrease the plasma concentration of uric acid and increase that of xanthine and hypoxanthine. Xanthine and hypoxanthine are water-soluble and gets eliminated in urine without precipitation and crystallization. Zyloprim is indiacted for the treatment of chronic gout. The long-term therapy of Zyloprim can cause tophi to disappear and to stop the progression of neuropathy. 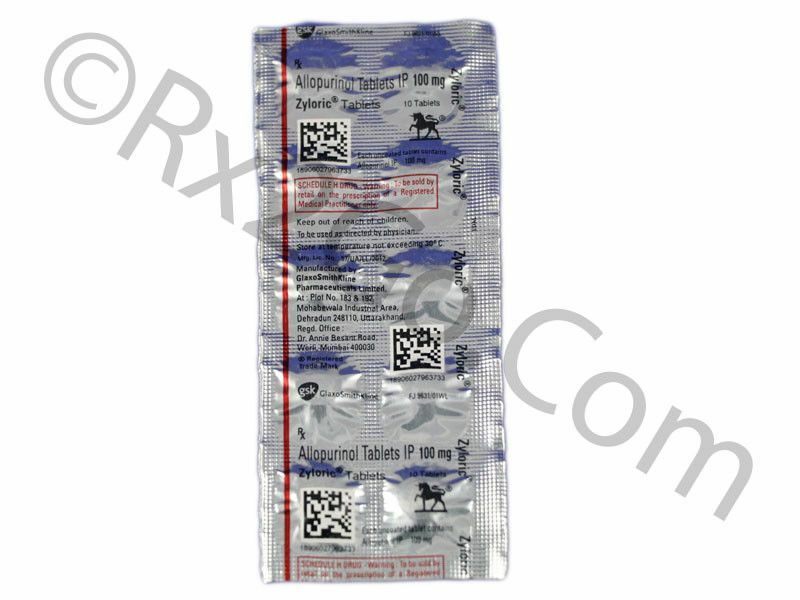 You can easily buy Allopurinol here at Rx 2 Go Pharmacy. 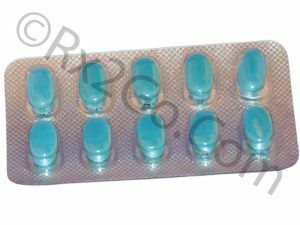 Manufacturer: Cipla Brand Name: Zyloprim Average Delivery Time: 10 to 14 days express shipping - or 3 to 4 weeks for regular shipping. How does Allopurinol / Generic of Zyloprim work? Zyloprim is a structural analogue of hypoxanthine. Zyloprim is an inhibitor of xanthine oxidase, the enzyme responsible for the conversion of hypoxanthine to xanthine and of xanthine to uric acid. The common side effects reported with Zyloprim are diarrhea, nausea, alkaline phosphatase increase, acute attacks of gout, rash, maculopapular rash, ecchymosis, fever, headache, necrotizing angiitis, vasculitis, hepatic necrosis, granulomatous hepatitis, hepatomegaly, hyperbilirubinemia, cholestatic jaundice, vomiting, intermittent abdominal pain, gastritis, dyspepsia, myopathy, arthralgias peripheral neuropathy, neuritis, paresthesia and somnolence. Zyloprim can be taken after meals to minimize gastric irritation. Zyloprim inhibits the degradation of 6-mercaptopurine and azathioprine. The concomitant administration of probencid and Allopurinol should be avoided. Probencid shortens half-life of Alloxanthine (metabolite of Allopurinol) and Allopurinol prolongs the half-life of probencid. Allopurinol can potentiate warfarin and theophylline by inhibiting their metabolism. The co-administration of ampicillin and Zyloprim can cause higher incidence of skin rashes. Iron therapy is not recommended during Zyloprim treatment. Liberal fluid intake is advocated during Zyloprim therapy. Zyloprim is contraindicated in hypersensitive patients. Allopurinol is not indicated for use during pregnancy and lactation. Allopurinol should be cautiously used in elderly, children and in kidney or liver disease. What are the common dosages of Allopurinol / Generic of Zyloprim? The recommended starting dosage of Allopurinol is 100-200mg daily. The maximum tolerated dose of Allopurinol is 800mg daily. The active ingredient is Allopurinol in both brand and generic forms because of which the mechanism of action and drug interactions are the same. The difference between brand and generic forms are packaging, pricing and the brand name. Generic variants are priced cheaper because there are no brand names associated with it as well as no expenses towards research and development. You can buy cheap Zyloprim medicine when it is sold as a generic variant. Where and How to buy Allopurinol / Generic of Zyloprim? You can purchase Zyloprim medicine online from our pharmacy. When you order Zyloprim drug online from us, it will reach your doorstep without any hassles. You can also save more when you buy Zyloprim online in more numbers with the volume discounts we offer. Why is the price of Allopurinol / Generic of Zyloprim so cheap at Rx 2 Go Pharmacy? At Rx 2 Go Pharmacy, we are always working out methods to save costs. Our costs towards research and development are zero, since we sell only generic prescription drugs. We source the drugs directly from the manufacturers and also order in bulk volume. All the savings from the various methods adopted translate to cheap prices of our drugs.